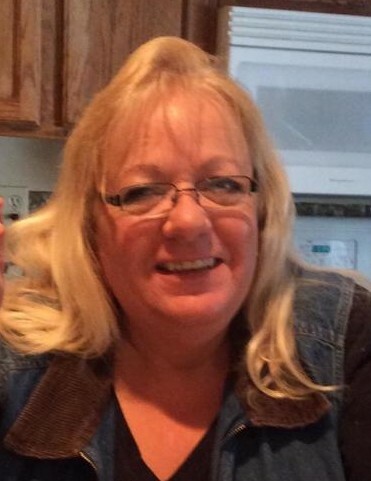 Kelly Jo Meusburger, age 62, of Truesdale, Iowa died on Thursday, January 10, 2019 at her home in Truesdale. Memorial services will be held on Thursday, January 17, 2019 at 10:30 a.m. at the Sliefert Funeral Home in Sioux Rapids. Burial will be in the Lone Tree Cemetery in Sioux Rapids. Visitation will take place one hour prior to the service at the funeral home. The Sliefert Funeral Home in Sioux Rapids is in charge of the arrangements. Kelly Jo Cheevers, the daughter of Howard and Pearl (Foust) Cheevers was born at Sioux Rapids, Iowa on March 3, 1956. She lived her youth and received her education at Sioux Rapids, graduating from the Sioux Rapids High School in 1974. Following graduation, Kelly worked as a CNA at the Sutherland Nursing Home and later became a certified med aide and had also been an activity director. She later was employed at Bil-Mar Foods in Storm Lake. Kelly loved to cook and was involved in cooking throughout her entire lifetime. On July 5, 1996, Kelly was united in marriage to Micheal Meusburger and they enjoyed 14 years together. Kelly and Mike owned and operated a restaurant in Truesdale and she also was a cook at the 3 & 71 Truck Stop. In later years, Kelly was a flagger for a road construction company until her health prevented her from doing that. Kelly was an artist and enjoying drawing and doing various types of crafts. She also loved being outdoors and fishing. Kelly Jo’s life is honored and cherished by her family which include her children: Josh (Jennifer Jones) Mahler of Paullina, Iowa, Corey (Kari) Meusburger of Sioux City, Iowa, Chad (Jessica) Mahler of Sutherland, Iowa, and Misty (Reid) Jensen of Sioux Falls, South Dakota, her grandchildren: Brayden and Kylan Mahler, Meah, Micah, and Maddox Meusburger, and Addison, Alex and Gena Jensen, four brothers: Dutch Cheevers of Truesdale, Iowa, Porky (Sherry) Cheevers of Max Creek, Missouri, Digger (Marcia) Cheevers of Spencer, Iowa and Larry (Sheila) Cheevers of Des Moines, Iowa, one sister: Suellen of Cherokee, Iowa, nieces, nephews, other extended family and many friends. She was preceded in death by her parents and three brothers: Conrad, Bruce and Gary.